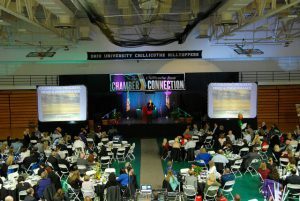 Humorous inspirational speaker Marti MacGibbon spoke to over 350 business leaders in Chillicothe, Ohio at the city’s annual Chamber of Commerce dinner held at the Shoemaker Center on Ohio University Chillicothe campus. The theme of the event was Progress, Pride, and Perseverance, and focused on resiliency and overcoming challenges. 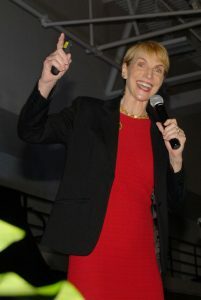 The audience responded with a standing ovation. Chillicothe, Ohio is a thriving, closely-knit community, home to the ancient sacred Hopewell earthworks, also known as America’s Stonehenge. The community’s businesses and leaders are role models, since their energy, innovation, and unity help to build local economy while confronting issues that affect all their citizens.The Chillicothe Gazette’s Chris Balusik covered the event, and he’s a terrific writer.